Here is the final part of the Chewin interview - I really hope everyone enjoyed it! FDC: What has been the most rewarding part of making doll-size clothes? Chewin: The most rewarding part of making doll clothing is when the buyer purchases one of our products, and they truly appreciate all the hard work and creativity that has gone into creating the doll. Being admired for my hard work, dedication and creativity is a very rewarding feeling for me. Chewin jeans fashion on my FR Primal Urges Francisco Leon. Check the details and finishes inside and out. Detail of the same outfit with it's knit t-shirt. The exquisite belt has a snake skin insert in the original leather. FDC: What is the most difficult part of making doll-size clothes? Chewin: Working with dolls is a very difficult and time consuming task because of the precision needed in creating a beautiful product. Dolls are very small in size so they require a great deal of concentration and patience. I would have to say working on the sleeves of the dolls is one of the most difficult challenges I face during the entire creation process. I am working with a very small space and the slightest mistake can ruin the entire product. Here is a Chewin FR sized fashion on a Hot Toys action figure from Aliens. Except from the length of the pants, it fits great. All accessories except shoes from Chewin. FDC: Are we going to see more accessories for your outfits? Like bags and shoes? Your belts are very well made. Chewin: No, actually, there is a skilled craftsman that lives near my house. He creates many items for dolls such as furniture, cloths, weapons, belts and shoes. But I think only Matt’s shoes and belts are the best work he has done. FR Tête a Tête Pierre De Vries in a Chewin vest, scarf, shirt, jeans and belt. Chewin: For clothes, I think nice and neat details are rather outstanding in our fashions. For each doll I create, I always put real eyelashes [for dolls] on the upper lids and try to give it a profound look. FR Darius Reid in shirt, knit vest, shorts, belt and striped socks from Chewin. FDC: What has been your favorite outfit/piece so far and why? Chewin: I like the Tuxedo or any jackets for Matt O’Neil and casual wears for FR Hommes. 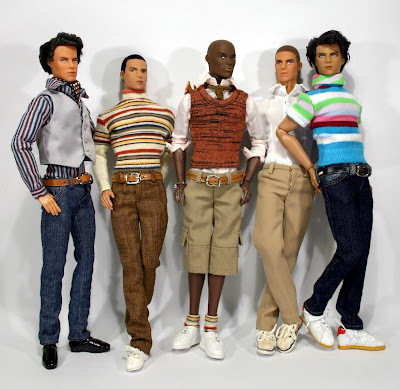 These fashions make the dolls look very exquisite. I plan to make such fashions for FR Females too. FR Hypnotic Francisco Leon in a Chewin coat, mock turtleneck, belt and pants. Bag and shoes by Fashion Royalty's Thrill Seeker outfit. Close up of the same outfit without the coat. You should realize the accurate proportion of the doll that you’re going to make the outfit for. You should select the proper fabric, pattern or even the button that should match or is suitable for the doll size. FR Euphoric Pierre De Vries in turtle-neck, leather belt and chequered pants from Chewin. Bag and shoes from FR Euro-Classic outfit. You should know the basic structure about human anatomy and muscle definition especially around the face area. You should realize the skills you have when using different techniques. You should realize that you can paint any details your mind imagines on the doll’s face with the smallest brush. The most important thing before making the repaint is : you should realize that after the repaint, your work should be better than the original paint that you have just removed. A change of clothes for Pierre: Coat, shirt and pants by Chewin. ...and the back: excellent workmanship. Chewin: My sister and I work on dolls purely for the love and satisfaction it brings us. We love our dolls and we take great pride in modifying them so they can be re-born with a new beautiful appearance that comes from our imagination. We are so honored that people all over the world can respect the hard work and effort we put into each doll that we work on. We are overwhelmed with excitements moments before our doll is to be auctioned on e-bay. I would like to say that creating dolls is a passion that my sister and I developed over the years. We are happy to create such beauty for the world to see. All we can hope is that people continue to appreciate our dolls and to keep selling them on a worldwide level. The Chewin gang: my FR Homme guys with clothes from Chewin. In the next post, I will feature Chewin's various repaints that have been sold at times on ebay. Stay tuned!